Exciting news, everyone! ＜/reality＞ has launched and is now available via Steam, Itch.io and Humble. The Story ＜/reality＞ is a philosophical visual novel about a ground-breaking new neural VR device that simulates a world indistinguishable from reality (questions about what is real ensue). The story is told from two perspective characters, Lilya, a beta tester who is trying out this VR device, and Jacob, the creator of the device. A Few Facts: The game is around 70k words long. Depending on your reading speed, it may take ~5-7 hours to finish one playthrough. It’s difficult to say exactly how many endings/routes there are. There are 4 very major and distinct endings, however, each of these endings can be modified in more minor ways depending on your choices. There are 12 epilogue panels that will change with each different playthrough, to wrap up different aspects of the story. There is some romantic content (3 possible pairings), but no adult content. There are 14 character sprites, 13 background scenes (some of which are double wide for panning), 13 full CGs, and many small image overlays. If you haven’t yet, this is the perfect time to check out the updated free Demo, over on Itch.io. We are now in the final 48 hours of the Kickstarter campaign! We are currently at 95% funded, and feeling optimistic! In terms of development, thanks to lots of insightful player feedback, we have begun a large, ruthless editing pass on Chapter 1 (the demo). We’ve trimmed it, rearranged it, and focused it, to create a better “hook” and keep the pacing exciting. These changes are feeling really good so far - we can’t wait to share the updated demo with you! If you have more feedback, please send it our way! We’re still working on Chapter 2 as well, and hopefully within a few weeks we will have an early draft of that to share with Beta-access backers. ^11 of the 14 characters - nearly the full cast! We’ve been putting a lot of effort into this game and we want to make sure it ends up being something truly special. We are so completely grateful to everyone who has supported us and believed in us. So, whether we succeed or not, we’d like to extend a big thank you to all of you from our team! Kickstarter Update! There are only 4 days left until the end of the campaign! We are now at 73% funded - can we make it?? If you haven't checked it out yet, the Kickstarter page is here: https://www.kickstarter.com/projects/davidmaletz/reality-visual-novel-game We’ve had several questions about romance in ＜/reality＞, so we are sharing a little about that - and a work-in-progress CG of Lilya and Ben, below (also added to the first post). Relationships in ＜/reality＞ are entirely optional and driven by player choice, and can be pursued from either Lilya’s or Jacob’s perspective (who each have two romance options). There are several different types of outcomes for each pairing. Similarly, your choices will affect Lilya and Jacob’s relationships with non-romance-able characters such as friends and family members. In other news, ＜/reality＞ was featured in an article on NerdybutFlirty! And, our Thunderclap now has 86 people signed up! Can we reach 100 in the next 3 days? Hopefully, or the message won't go out. Wish us luck! Thanks for the welcome, everyone! @ littleshogun - just to clarify, I wouldn't call my project "otome" exactly - while the three most major characters are two men and one woman, two of them are "perspective" characters - one male and one female. Romance is admittedly a minor element of the game, but the player can actually choose to pursue a romance from either the male OR female perspective... so in that sense, I guess it is technically both "otome" and "bishoujo" - which is a bit unusual. But there you go. Link to Trailer When a withdrawn virtual reality nerd has the opportunity to beta test a neural device that feels more “real” than reality itself, everything she assumed about the nature of existence is thrown into question. Download the Demo If you play, please take our feedback survey! Steam Page Story Supernovas blaze in the night sky and major natural disasters are commonplace, but the gaming world is abuzz over a revolutionary virtual reality console. The Penta, developed by InterMense founder Jacob Lessard, promises a direct, neural connection more “real” than reality itself. But what does it truly mean for something to be real? When VR nerd Lilya Martel arrives at InterMense as a beta tester, she expects to spend the weekend battling her social anxiety in exchange for the opportunity to enter Vitalia, the flagship Penta simulation.But the creatures of Vitalia seem more intelligent than any current AI could possibly simulate. And between the physical side-effects of the device and suspicious explanations from the developers, clearly all is not as it seems at InterMense. Ben Evers, another beta tester, claims that Vitalia is the world in which he belongs - permanently. When his life is threatened, Lilya sees that she has become involved in something much riskier and more eye-opening than she realized. As Lilya, Ben, and Jacob’s fates intertwine, they must make some of the hardest decisions of their lives, and confront their own beliefs and perceptions of the nature of existence. Features A Thought-Provoking Narrative - with several mind-bending twists and two perspective characters, the story is both philosophically ambitious and deeply personal. Choices That Matter - a heavily branching story line makes the game re-playable. Your decisions have major consequences - ranging from shifting a character’s attitude, to placing them on a different story branch, to re-directing the outcome of the entire game. Expressive Character Art and Visuals - 14 characters (each with various poses and expressions), 12+ background scenes, 17+ CGs/special illustrations, 15+ ending panels. Character and Relationship-Building - rich character development, affected by your choices, and with opportunities for both romantic and non-romantic relationship-building. Romance is optional, and may be pursued from either Lilya or Jacob’s perspective. ^ Work in Progress CG Original Music and Sound Design - by the talented composer Chase Bethea. Characters More character sheets on the way!! 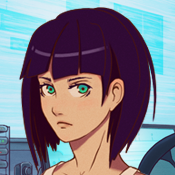 [Updated Oct. 26, 2016] Writing: 95% Editing: 25% Character Art: 65% Backgrounds: 50% CGs: 40% GUI: 60% Music/Sfx: 15% Programming: 70% </reality> is being made by the folks at Fancy Fish Games. We are a tiny indie gamedev studio, passionate about making thought-provoking games. Art & Writing: Natalie Maletz (RedOwl) Code & Story: David Maletz (terra0nova) Music & Sound: Chase Bethea What we hope to get out of this thread - Let you know we exist - Share our progress, updates and announcements - Receive feedback, comments, and critique Does the story interest you? Why or why not? Which part(s) of the story description entices you the most? Is the character art appealing to you? Why or why not? How do you feel about the character descriptions? Did they make you interested to know more about the characters? Why or why not? What do you think of the background art? The game focuses on plot/character development (romance is optional) - is that a downside for you? Have you played or are you planning to play the free demo? Any other comments, observations or critique? We want to hear it all! Follow the project on Tumblr! Follow us on Twitter! Hey, congrats on the Kickstarter launch! Looks like you are doing very well already - that's awesome! The project looks really fun, energetic, and entertaining. I like the cute art style and the expressiveness of the characters. And I like that it seems humorous in a kind of wacky/absurd way (that's my kind of comedy). I also find it very interesting that it is multiplayer - that's something that's usually difficult to incorporate into story-heavy games. How will the multiplayer work, exactly? Will it be LAN? What I like least about the project: the dating sim elements and the general theme of "find a date to the prom." This makes me concerned that the story/events might be shallow or boring. I like stories that have some depth and impact. However, if the humor is good enough, this might not be a major problem for me. The character that is most appealing to me is the fiery-haired gal - from the art, she seems fun and chill - I like her dancing image especially - she just looks super graceful and confident. Good luck with the kickstarter!